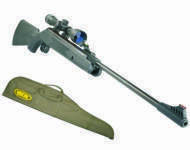 Kral Devil break barrel air rifle. Full power, light weight with high visibility fibre optic sights. This version has the synthetic stock in black but it is also available in Mossy Oak camo, Duck Blind camo along with a carbon fibre effect finish or even a synthetic thumbhole stock which is called the Champion. If you prefer a more traditional stock then you can have a beautiful Turkish walnut. Kral Devil break barrel air rifle. 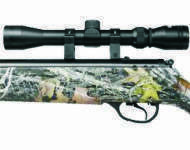 Full power, light weight synthetic stock finished in Mossy Oak camo. High visibility fibre optic open sights, ventilated recoil pad, scope rails. Two stage trigger, manual safty and a smooth easy cocking action. Kral Devil break barrel air rifle. Full power, light weight synthetic stock finished in Duck Blind camo. High visibility fibre optic open sights, ventilated recoil pad, scope rails. Two stage trigger, manual safty and a smooth easy cocking action. Kral Devil break barrel air rifle. Full power, light weight synthetic stock finished in a carbon fibre effect. High visibility fibre optic open sights, ventilated recoil pad, scope rails. Two stage trigger, manual safty and a smooth easy cocking action. kral Devil Champion air rifle. Full power and light weight with thumbhole synthetic stock and intergral silencer. High visibility fibre optic open sights, ventilated recoil pad, scope rails. Two stage trigger, manual safty and a smooth easy cocking action. Kral Devil air rifle. Beautiful Turkish walnut stock for those that prefer the look and feel of wood. Full power, high visibility fibre optic open sights, ventilated recoil pad, scope rails. Two stage trigger, manual safty and a smooth easy cocking action. 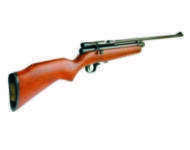 Kral air rifles for sale in Leicestershire. 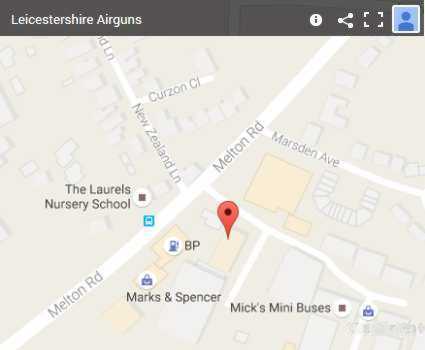 Leicestershire Airguns can deliver your new Kral air rifle using our own local air rifle delivery service.